The simple pleasures of Jost Van Dyke are the reason to visit. Recline on pristine beaches, and marvel at the most beautiful scenery the Caribbean has to offer. The island was named after Joost van Dyk, an unremarkable Dutch pirate. Look at the place. Would you expeditiously leave on pirating expeditions having found such a paradise? I think not. Of course, the presence of the Royal Navy may have combined with the scenery to compound his reluctance to become more active. Couple the presence of a lazy pirate with an agreeable Royal Navy’s penchant for drinking grog (a combination of rum and water), and it seems quite logical this island invented that most potent of cocktails: the Painkiller (described below). Jost Van Dyke is ringed with fetching beaches, most of them amply crowned with bars and restaurants right there by the snow-white sand. At three miles by four and with a couple of hundred residents, it’s one of the smaller populated landmasses in the BVI and often referred to as the prettiest. It’s extremely popular with sailboats. Jost Van Dyke is easily accessible (one or two hours) by boat from St. Thomas and St. John, whether you take a ferry or charter a boat yourself. St. Thomas is the closest international airport. 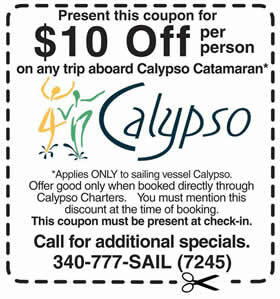 You can ferry to St. John and the BVI. Where to Drink & Eat? Aside from the aforementioned Soggy Dollar Bar (so named because there’s no dock or quay; you have to eponymously swim or dingy ashore), most places peddling booze also supply food. There are no ATMs on the island, and not everywhere takes credit cards, so bring ample cash or be prepared to pay about 10% for the privilege of getting cashback from a vendor. Aside from the myriad of exceptional beaches, there’s the Bubbling Pool; a small lagoon protected by rocks, that bubbles uncontrollably when a wave rolls in. As the island is so small, everywhere is accessible by a relatively easy hike, but watch the roads. They’re narrow dirt tracks, and locals tend to fly around corners with abandon. Every cook knows the difference freshly grated nutmeg makes. The flavor deteriorates exponentially over time, which is why the pre-ground stuff tastes like a pinch of powdered navel lint. Despite this common culinary convention, almost every bar you belly-up to in the British Virgin Islands will sprinkle some on your Painkiller from a generic shaker. This shrivels anticipation like a cold bath: I don’t enjoy spending ten to fifteen bucks on a plastic-cupped cocktail unless it’s crafted from the finest ingredients. I’d rather have a twelve pack, a bucket of ice, and invest in a beach hammock for the afternoon. Not very adventurous, I acknowledge, but such behavior is balm for the soul. So what is a Painkiller? The national drink of the British Virgin Islands, this delicious concoction is the beverage of choice anywhere you visit, especially if the island in question is Jost Van Dyke. 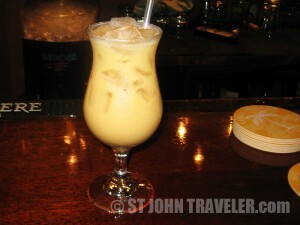 The best of the bunch is, in my opinion, to be had from the Soggy Dollar Bar in White Bay. There’s many other bars on the island, but this is the place to go for a PK. 4 oz Pusser’s Rum (official rum of the British Navy, who supplied the booze for the original cocktail). Adjust volume as necessary for your mood and condition. I also like Cruzan 9 Spiced Rum, because, well, it’s delicious. At this ratio the alcohol content is about the same as wine. So keep count accordingly (assuming you know your limits) or they’ll creep up on you like decorum assassins. Folks, you don’t go to Jost Van Dyke for raucous activity. You go there to lie back, snooze, and live like a Corona commercial for a day or two. There’s hiking and scuba-diving for the more active among us, but for me, this is a place to reflect amongst the most jaw-dropping beach scenery this side of Thailand.